I often check out the children's craft section for inexpensive plastic tools. I spotted this spinning loom a couple of years ago and bought it. I have no association with the manufacturer but I thought it has great potential. 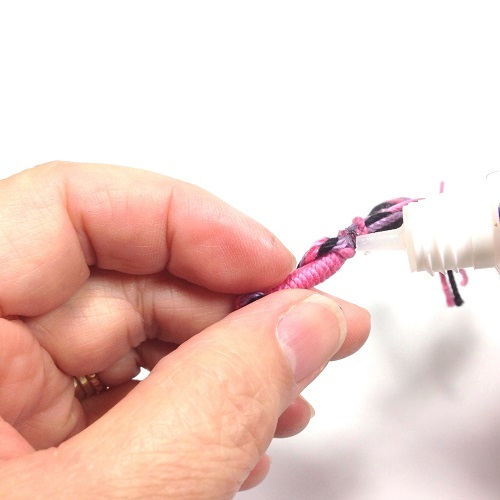 Thread wrapped bracelets and necklaces will be really easy and fast with this tool. Wrapping thread around a core is usually very time consuming. 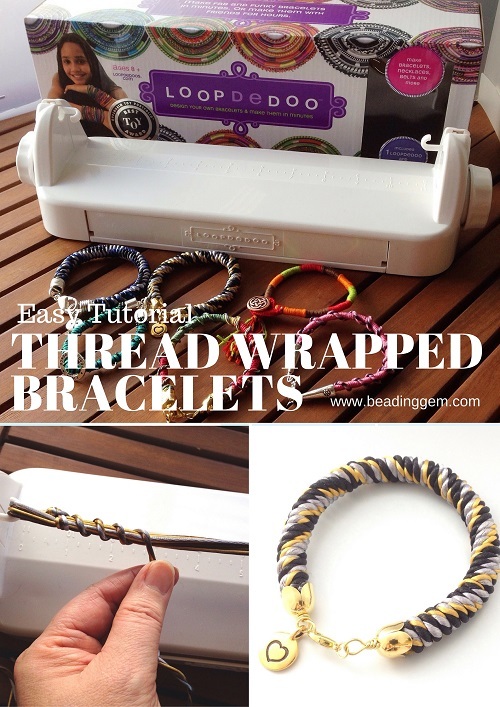 While the Loopdedoo Spinning Loom Kit is marketed as a great friendship bracelet maker for the younger set , the "age 8+" designation can certainly be stretched right up to the adult range. Several lengths of the working thread or thin cord is used to form the core rather than a thick cord. These are looped around the hooks. Wrapping is achieved with the turning of the side dials. What makes this tool work well is the gear slot (shown below) where the threads not in use is safely kept out of the way. Otherwise, these will get tangled up. Other than that, the tool is easy to use as shown in the brief quick start video. The video really helps. The instruction manual also gives the number of extra lengths of yarn or thread needed for specific thicknesses of the core. 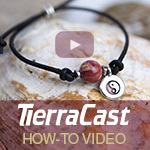 There are six styles of bracelets so their other video is also worth watching. Bracelets are easiest although the manual also explains how to do necklaces in two stages. 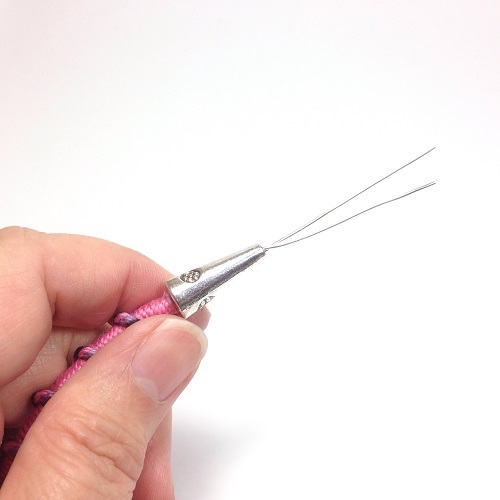 Embroidery thread is usually used for this tool but other threads such as crochet cotton, macrame cord, yarn, satin cord and hemp are also possible. 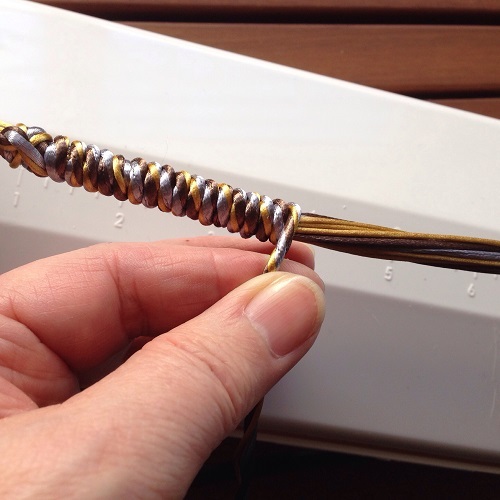 The tool certainly sped up the making of bracelets so much I had made 6 in no time at all! Most of them took me 10-15 minutes to make, not counting the finishing. The video tutorials showed a simple way of knotting and tying on the bracelets appropriate for children. But we can finish them a lot better. 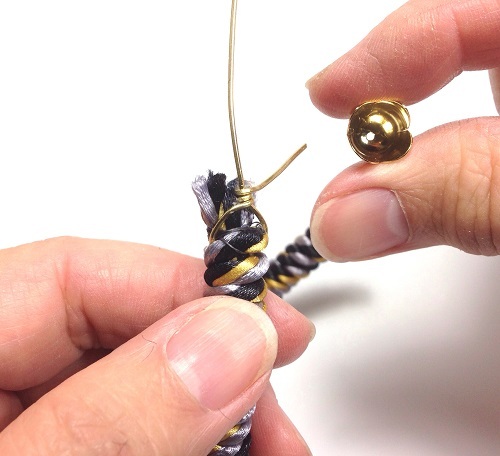 I used 6 lb Fireline to secure and sew the ends of each of the bracelets. Not only did I wrap the Fireline around the bundle but also sewed through it several times. Once well knotted, the Fireline is trimmed close to the bracelet. I like using Super New Glue (not the same formulation as the regular Super Glue) as it is a liquid. A drop or two of this glue will be enough to seep through and bind all the cotton threads together. E6000 is more viscous and will not seep as well but is also okay to use. 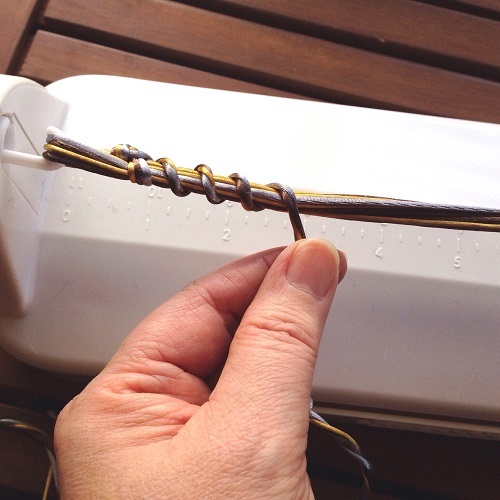 I then fed a length of 20 G wire through the bundle underneath the knotted and glued area. I could feed both wires through the metal cones I used. 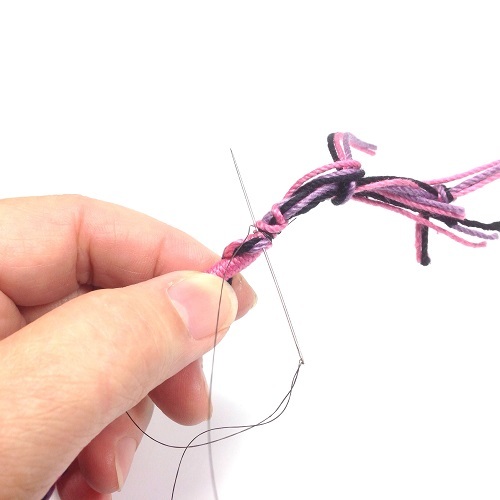 Do a wrapped loop at each end. 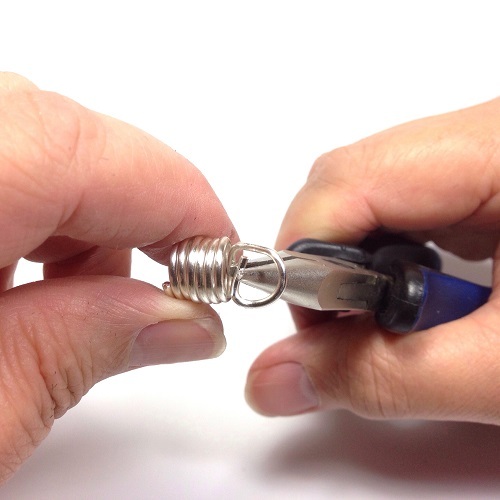 If the end cap's hole is too small to take both wire ends, then form a wrapped loop first to deal with one wire end. The other goes through the end cap and another wire wrapped loop is carried out. Satin cords like the rattail cords are really too slippery to do the twisted wrapped bracelet as the twisted cord would not stay in place. So why fight it? I moved all the twisted cord together which resulted in a lovely style. Needless to say, one needs more cord than normal - about 50% - to do this. 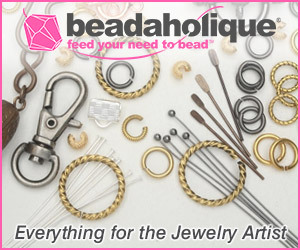 If you don't have any bead or end caps to fit the bracelet, just make short wire coils wire coils with a mandrel that yields the right size coils. I like to use my bail forming pliers for this. 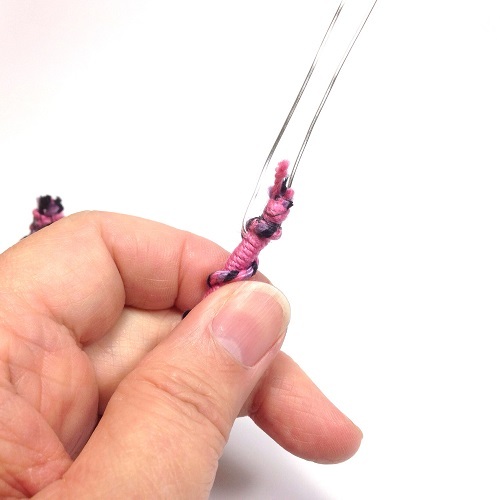 Once coiled, trim one end. Then make a large loop at the other end. Trim and bend the end as shown below so it can be tucked down. 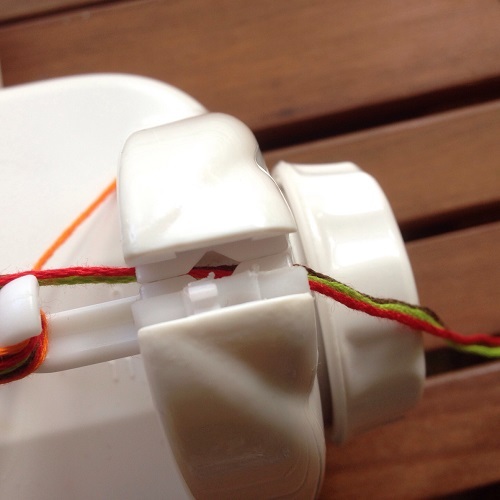 Add a bit of glue and then insert the cord bracelet into the coil. 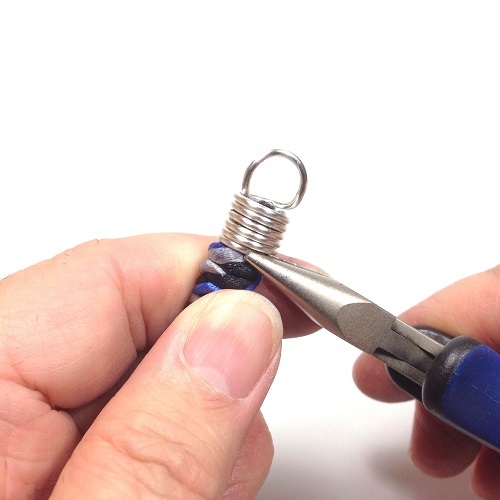 Use chain nose pliers to press down on the wire end so it helps secure the coil to the bracelet. 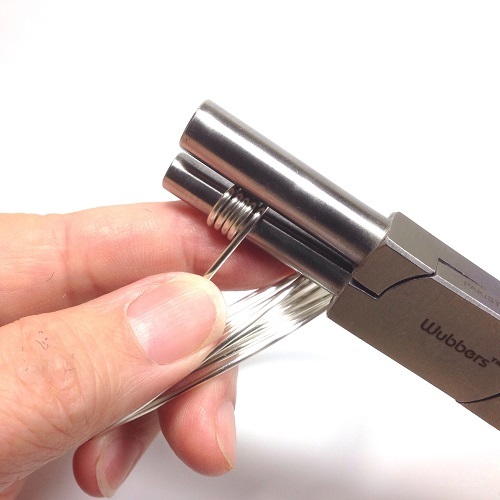 This rattail cord version also has three colors - silver, black and blue. I sometimes like to finish the ends with both end caps and wire coils as shown with this multi-colored bracelet. 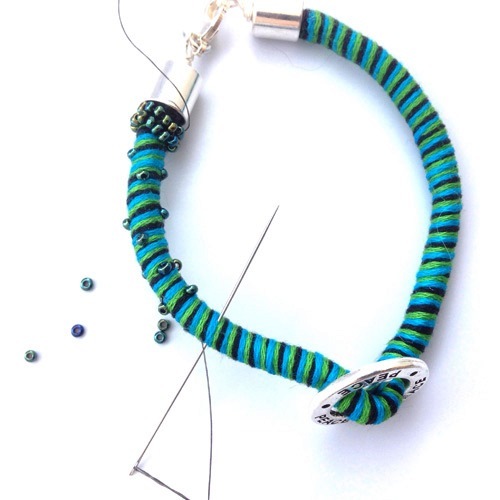 I also tried the button and loop clasp idea by first sewing on a button to one end of this embroidery floss bracelet. 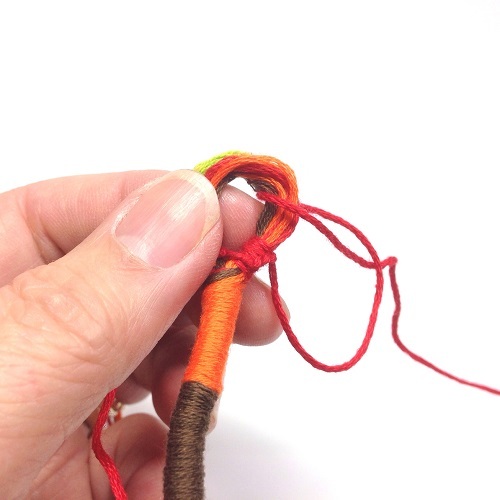 The other loop end was neatened with a series of half hitch knots using an extra length of embroidery floss. 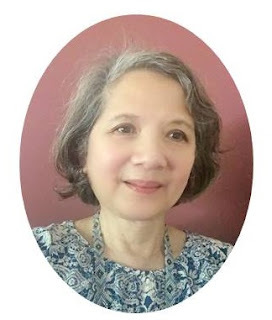 Once done, this length was carefully knotted and then trimmed. 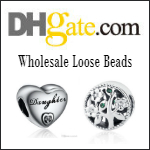 You can also embellish the thread wrapped bracelets. 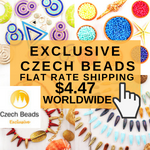 Sewing on seed beads is a breeze! Note that I receive some products for review. 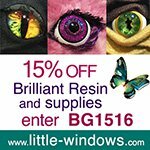 This site also uses affiliate links - if I think the products are great then this is where I tell you where to get it if you are interested. All final project photographs were taken on my iPhone 5 using the camera+ app and the Modahaus TS320 Tabletop Photostudio in natural light. If you have the Modahaus, try putting the black sheet behind the white to get that graduated grey effect. Tutorial photographs were taken with artificial lights in my windowless basement studio using the same phone camera, app and photostudio. 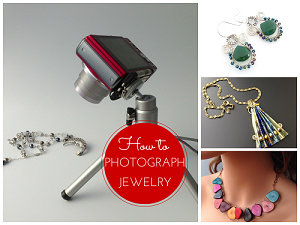 Click for more information on my How to Photograph Jewelry webinar. Will take some time and go back through this a couple of times I think. I really like how easy and simple these are and the colours are wonderful! Another great tutorial Pearl. My goodness you work hard for all of us! Well, I have fun while I am designing! 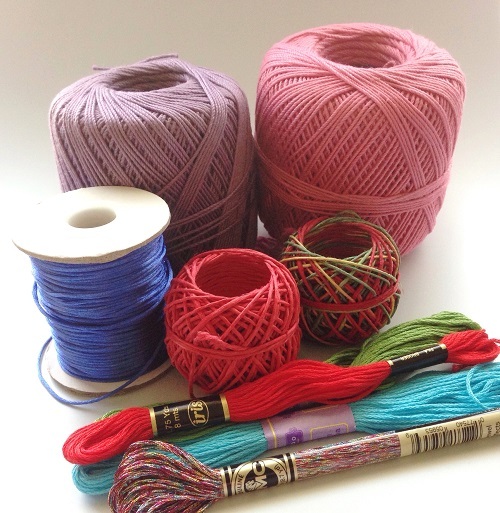 No need for embroidery floss if you haven't got it, try your yarn! I really have to check out the DIY section in stores for children more often. I hope to find a similar tool here for my huge yarn stash and I prefer the wrapped look to the knitted one! If you can't try Amazon. 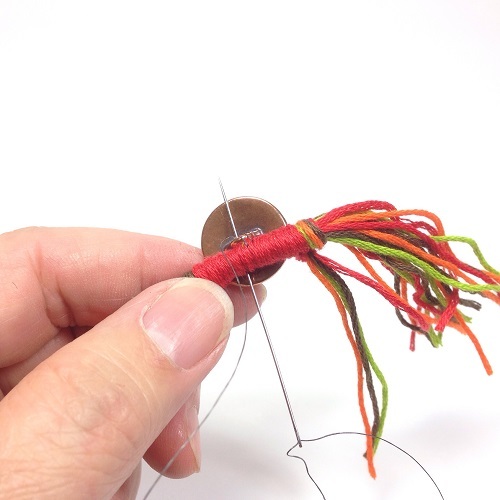 Yes, this tool is a huge help for busting yarn stashes! I agree the wrapped look is better than the knitted one. my senior's income. I wish I could spend a day or two with you to learn a few things...thank you for being so generous !